Regular dental check-ups are important even in childhood: the first dental visit should ideally happen at the age of 12-18 months. WANT TO PROTECT YOUR CHILD FROM DENTAL CARIES? Regular dental check-ups are important even in childhood: the first dental visit should ideally happen at the age of 12-18 months. At this age children can experience dental treatments without prior knowledge or dental issues. The very first dental event in a child's life is teething. This may go hand in hand with high bodily temperature, even fever, diarrhea, stomach ache or loss of appetite. These symptoms are almost always accompanied by increased salivation, mood swings and insomnia that can be relieved with gels, chilled baby teether, pain-relieving creams and homeopathic remedies. In the case of diarrhea and loss of appetite it is important to increase the fluid intake, while when the baby has a fever, it needs to be lowered. In childhood, brushing teeth needs to be taken seriously, babies have to get used to regular and thorough teeth cleaning right after teething begins. Early teeth can be cleaned with a diaper or a towel. At the age of 12-18 months, the so-called baby bottle syndrome can be recognised, when as a first sign of dental caries the front teeth begin to get chalk white and then turn brown. Unfortunately teeth decay very fast and only roots remain in the gum. This may cause pain in the beginning, and later on at the age of 5-6 years it may even lead to psychological issues because of their physical appearance. Baby teeth are usually first shed at about age 6 and it lasts until age 13. Wisdom teeth come out at different ages, often around age 18. When permanent teeth come out, it may be necessary to close the surface of the molars because dental caries may easily get through the small grooves on the surface and attack the inner parts of the teeth. Closing these grooves can prevent later tooth decay. The treatment consists of spreading a small amount of gel on the surface of the molars and then it can be filled with a liquid material. Shedding teeth may be accompanied by the growth of jawbones. It may occur that when there are baby teeth and permanent teeth present in the mouth at the same time, permanent teeth lean sideways or out of line. This process is normally restored by the growth of the jawbone. 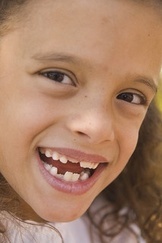 Your child needs orthodontic treatment? Learn more about it, click here!